Your new mirror comes with an integrated HomeLink Universal Transceiver, which allows you to program the mirror to activate your garage door(s), estate gate, home lighting, etc. The mirror actually learns the codes from your various existing transmitters. CAUTION • When programming the HomeLink® Wireless Control System, you may be operating a garage door or gate operator. Make sure that people and objects are out of the way of the moving door or gate to prevent potential harm or damage. • Do not use HomeLink with any garage door opener that lacks the safety stop and reverse feature as required by federal safety standards. (This includes any garage door opener model manufactured before April 1, 1982.) A garage door opener which cannot detect an object, signaling the door to stop and reverse, does not meet current federal safety standards. Using a garage door opener without these features increases risk of serious injury or death. For more information, call 1-800-355- 3515 or on the internet at www.homelink.com. • Retain the original transmitter for future programming procedures (i.e., new vehicle purchase). It is also suggested that upon the sale of the vehicle, the programmed HomeLink buttons be erased for security purposes (follow step 1 in the “Programming” portion of this text). NOTICE For non rolling code garage door openers, follow steps 2 - 3. For rolling code garage door openers, follow steps 2 - 6. For Canadian Programming, please follow the Canadian Programming section. For help with determining whether your garage is non-rolling code or rolling code, please refer to the garage door openers owner’s manual or contact HomeLink customer service at 1-800-355-3515. NOTICE Some gate operators and garage door openers may require you to replace step #3 with the “cycling” procedure noted in the “Canadian Programming” section of this document. Rolling code programming To train a garage door opener (or other rolling code equipped devices) with the rolling code feature, follow these instructions after completing the “Programming” portion of this text. (A second person may make the following training procedures quicker & easier.) 4. Locate the “learn” or “smart” button on the device’s motor head unit. Exact location and color of the button may vary by product brand. 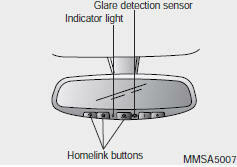 If there is difficulty locating the “learn” or “smart” button, reference the device’s owner’s manual or contact HomeLink at 1-800- 355-3515 or on the internet at www.homelink.com. 5. Press and release the “learn” or “smart” button on the device’s motor head unit. You have 30 seconds to complete step number 6. 6. Return to the vehicle and firmly press and release the programmed HomeLink button up to three times. The rolling code equipped device should now recognize the HomeLink signal and activate when the HomeLink button is pressed. The remaining two buttons may now be programmed if this has not previously been done. Refer to the “Programming” portion of this text. Operating HomeLink To operate, simply press the programmed HomeLink button. Activation will now occur for the trained product (garage door, security system, entry door lock, estate gate, or home or office lighting). 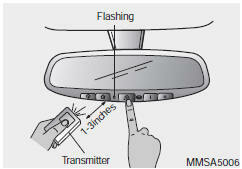 For convenience, the hand-held transmitter of the device may also be used at any time. The HomeLink Wireless Controls System (once programmed) or the original hand-held transmitter may be used to activate the device (e.g. garage door, entry door lock, etc.). In the event that there are still programming difficulties, contact HomeLink at 1-800-355-3515 or on the internet at www.homelink.com. Erasing programmed HomeLink buttons To erase the three programmed buttons (individual buttons cannot be erased): • Press and hold the left and center buttons simultaniously, until the indicator light begins to flash (approximately 20 seconds). Release both buttons. Do not hold for longer than 30 seconds. HomeLink is now in the train (or learning) mode and can be programmed at any time. Reprogramming a single HomeLink button To program a device to HomeLink using a HomeLink button previously trained, follow these steps: 1. Press and hold the desired HomeLink button. Do NOT release until step 4 has been completed. 2. 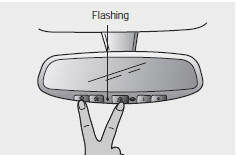 When the indicator light begins to flash slowly (after 20 seconds), position the hand-held transmitter 1 to 3 inches away from the HomeLink surface. 3. Press and hold the hand-held transmitter button (or press and “cycle” - as described in “Canadian Programming” above). 4. The HomeLink indicator light will flash, first slowly and then rapidly. When the indicator light begins to flash rapidly, release both buttons. The previous device has now been erased and the new device can be activated by pushing the HomeLink button that has just been programmed. This procedure will not affect any other programmed HomeLink buttons. Gate operator programming & canadian programming During programming, your hand-held transmitter may automatically stop transmitting. Continue to press and hold the HomeLink button (note steps 2 through 4 in the “Programming” portion of this text) while you press and re-press (“cycle”) your handheld transmitter every two seconds until the frequency signal has been learned. The indicator light will flash slowly and then rapidly after several seconds upon successful training. NOTICE If programming a garage door opener or gate, it is advised to unplug the device during the “cycling” process to prevent possible motor burn-up. Accessories If you would like additional information on the HomeLink Wireless Control System, HomeLink compatible products, or to purchase other accessories such as the HomeLink® Lighting Package, please contact HomeLink at 1-800-355-3515 or on the internet at www.homelink.com. This device complies with Industry Canada Standard RSS- 210. Operation is subject to the following two conditions: 1. This device may not cause interference, and 2. This device must accept any interference, including interference that may cause undesired operation of the device.